Does your residential or commercial building have reliable fire fighting systems? A fire-hose reel is indispensible; you should have one. It will enable your employees and/or tenants to access the location of the fire safely and effectively, providing a controlled stream of water to douse the flames. It does, however, require training as it can cause serious damage if handled improperly. Albilad Fire Fighting Systems Company Limited is an acknowledged leader in the design, manufacture, and installation of fire and gas protection systems in the Middle East. We have been protecting life and property from fire in and around Saudi Arabia for more than 35 years. Our team of qualified and experienced professionals employ the latest knowhow and state-of-the-art local manufacturing facilities to deliver leading-edge fire protection systems. Saudi ARAMCO style: A high quality hose reel on a pedestal stand built to the exacting standards required by ARAMCO. The reel is supplied complete with a 1¼ inch non-collapsible rubber hose and a variable flow and pattern fog nozzle. The hose reel comes complete with a gear driven rewind and a rewind handle. 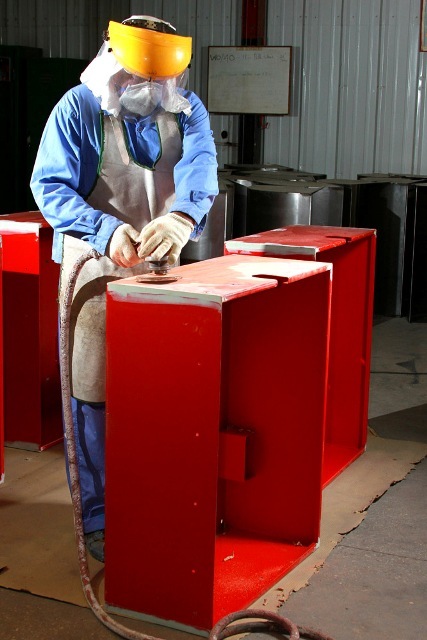 The reel, cover, and stand are all painted with durable baked enamel for extra corrosion resistance. Industrial type: A heavy-duty fire water-hose reel for use in petrochemical plants, power stations, and refineries. The hose reel is manufactured in Saudi Arabia to international standards. It includes approximately 30 meters of a 1½ inch diameter oil-and-abrasion-resistant hard rubber hose and a variable fog nozzle. The reel is suitable for applying either water or a foam-water mixture. Albilad Fire Fighting Systems Company Limited is a trusted name in fire protection. 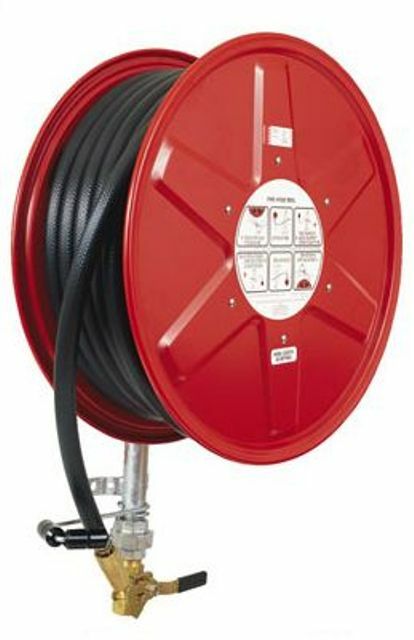 Place an order with Albilad for a top quality fire hose reel for your business or residential building in Saudi Arabia/Middle East. Top Quality Fire Hose Cabinets for Residential, Commercial, and Industrial Use. Albilad Fire Fighting Systems Company Limited caters to a wide variety of residential and commercial needs. We represent many well-known names, such as Ansul (USA) and Notifier Fire Alarm Company (USA). Whatever your type of facility or industry, we have a fire protection system for you. In fact we specialize in fire fighting or suppression systems for high-risk areas with turnkey capabilities. 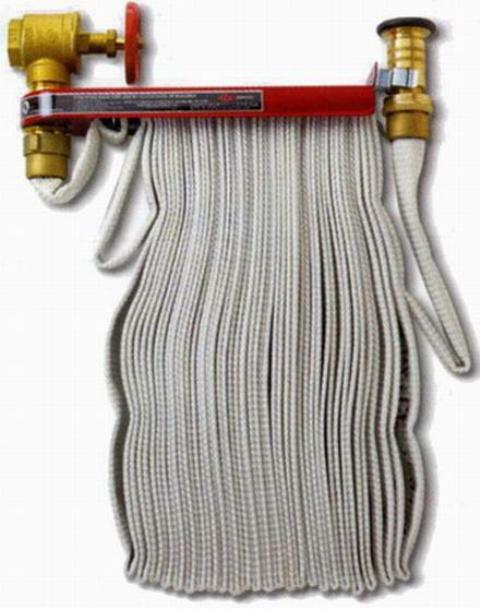 Fire alarms, fire hose reels, fire hydrants, and eye safety showers: we have everything you need. Our hose-reel cabinets, in particular, are top quality. 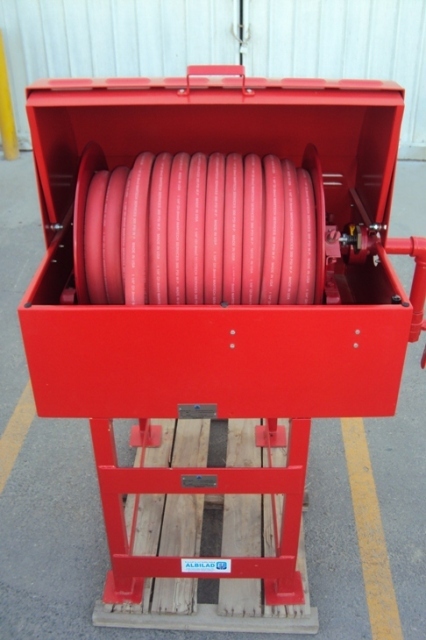 What type of fire-hose reel cabinets do we have? Surface-mounted hose cabinet: Designed for indoor semi-automatic hose stations, consisting of an unlined cotton hose or rubber hose release rack (approximately 30 meters of hose), hose nozzle, and valve. This hose-reel cabinet is normally located in stairwells or corridors. Every point in a building should be within reach of at least two hose lines. This cabinet also has ample room inside for storage of a 10 kg portable extinguisher. This cabinet is red and comes in two versions. On both of these cabinets, the door is attached by a stainless steel continuous piano hinge for extra life. Flush-mounted hose cabinet: Identical to the surface mounted hose cabinet (red with stoving enamel for added heat resistance). This cabinet has a trim ring for flush mounting so that the cabinet slides easily into a hole cut into the wall and covers any rough-cut edges. Albilad Fire Fighting Systems Company Limited has modern local manufacturing facilities to produce fire hose-reel cabinet assemblies that suit your facility and the specific needs of your industry. We make it easy for you to have the exact fire protection system that you require at competitive prices. Place a Service Contract/Agreement with Albilad for fire hose reels and cabinets. Or contact us for more information about our advanced firefighting systems including cabinet assemblies in Saudi Arabia.